Customers of a family-owned Shropshire firm which specialises in ready mix concrete have welcomed its brand new interactive website. General Manager Dave Morris said the company had 12 concrete plants covering the whole of Shropshire, Cheshire, and North and Mid Wales. Dave said TG Concrete specialised in a wide variety of products including concrete that can be pumped or poured, concrete that will flow, concrete that is ultra high strength, or products that set rapidly or slowly. “We’ve also introduced coloured concrete and specialised floor screed options, as well as a range of three products developed specifically for the agricultural sector, called AgriCrete. 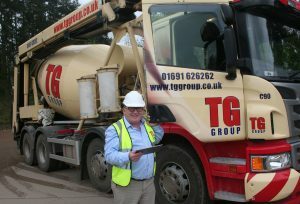 TG Concrete is made up of a team of dedicated and experienced staff, and their skills and knowledge are the key to the success of the division.